The US Sentencing Commission has extended invitation for public comments on retroactivity of the Fairness in Sentencing Act until June, 1, 2011. The Commission wants to hear from you regarding crack cocaine sentencing retroactivity. Consider sending the letter we suggested Razor Wire readers personalize for the Commission. Read the Commission's Analysis of the Impact of the Fair Sentencing Act if made retroactive (2011). The New York Times is covering what the report describes as a "Judicial Renaissance." Read, Judges See Sentencing Injustice, but the Calendar Disagrees. Washington Post has a February 2011 Editorial in support of crack retroactivity. The Federal office of public defender's website has legal resources on recent cocaine sentencing changes. The Sentencing Project has a more information about the crack cocaine disparity and changes in 2010 law. Scroll through the images to read through some of Ed's media coverage. This time, he's taking on TV. When we left him last month, the man on a mission to end the drug war and legalize marijuana was facing jail time for refusing to submit to DNA tests as a condition of his parole. 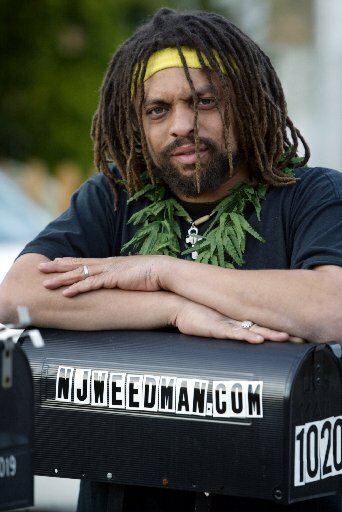 He was also fighting the state's refusal to allow him to change his name from Ed Forchion to that of a Web site, www.NJWeedman.com, mounting a congressional campaign, and lamenting his financial ruin. Forchion's political fortunes, alas, don't amount to much, either. Taking a cue from Howard Dean, Forchion -- an asthmatic Rastafarian former truck driver and doobie devotee - raised $500 in Internet donations from fellow smokers and tokers. Money in hand, he marched over to Comcast's Mount Laurel office to buy time for a few campaign ads. He wants to get on CNN and the Fox News Channel to reach Democrats and Republicans. And BET, because, as an African American, he feels "a lot of black people don't participate" in politics. Plus, he adds, "so many young people in the hip-hop movement smoke marijuana. And they watch TV." So far, the cable giant has left his request smoldering in the wind, hinting that his ads might not be fit to air. So now, the Weedman finds himself in yet another fight over life, liberty and the pursuit of lighting up legally. Which, if you know Ed, is exactly where he wants to be. Thank goodness the Weedman is underemployed. It stinks for his family but does provide more time to fan the flames. This former felon's a natural. Unlike professional politicians, the Weedman doesn't wiggle and waffle over what he stands for. He just wants to end the drug war and legalize pot. In the last few years, he's run for county freeholder, the state Legislature and Congress on the U.S. Marijuana Party ticket. Sometimes, he seeks two elective offices at the same time. This go-around, the Weedman runneth against 10-term Republican Congressman Jim Saxton in the Third District spanning Burlington, Camden and Ocean Counties. After announcing his intentions just before Christmas, the Weedman edited some public service spots he filmed a few years back to conform to candidate standards. By conform, he means adding the tag line "Paid for by Ed Forchion for Congress" to the end of the ads. Because the message, then and now, remains the same. "I'm here before one of the world's greatest symbols of freedom to let you know the liberty this flag represents is in grave danger," he says in one ad, standing in front of the stars-and-stripes, wearing a black T-shirt emblazoned with a marijuana leaf. "As with alcohol prohibition in the 1920s, the drug war is destroying our free society," the Weedman argues. "It's time we return freedom to America by ending the war on drugs." "It's really a war on individual liberties. And that's just un-American." Turns out, the Weedman is right on his rights to preach for pot on TV. Cable operators and networks have little discretion over campaign ads. Air one for one candidate, and you must air them for all candidates. Comcast can intervene only if the material is deemed obscene. "Comcast routinely carries advertisements for qualified candidates pursuant to federal regulations," the company's spokesman, Tim Fitzpatrick, said after I inquired about the Weedman's runaround. When and where the ads would pop up, Fitzpatrick couldn't say. Just that they will, so long as the Weedman can pay. After watching the proposed promos, may I suggest he run them through the editing machine again? In one ad, he claims that "scientific facts" prove that pot has never killed. Campaign pros know to never, ever express such certitude, lest your opponent use it to hang you. Even worse, in all three ads, Forchion forgets to give voters the most crucial piece of electoral info: What he's running for, against whom, and where. While he remains mired in legal troubles and no closer to seeing himself in front of the U.S. Supreme Court to argue his " right" to smoke marijuana, things don't look half bad for Ed Forchion. At least he can toke up and test his interpretation of federal laws without the fear of jail time. Following the Nov. 12 sentencing hearing where he received a year of probation and a $150 fine for drug possession after organizing a series of marijuana smoke-outs at the Liberty Bell, Forchion, aka NJ Weedman, was worried. "Pencil me in jail," he said, predicting he wouldn't have much luck passing court-ordered drug testing [News, "Up in Smoke," Cory Frolik, Nov. 18, 2004]. Forchion's argument was simple. Since he is Rastafarian, smoking marijuana is a religious sacrament. As such, he was protected to do so on federal property thanks to the 1993 Religious Freedom Act. The judge, however, wasn't having it. Less than two months later, however, Forchion has seemingly caught a break. His motion for a stay of sentence (a plea to the District Court to throw out his punishment while he goes through the appeal process) was granted by U.S. District Judge Stewart Dalzell earlier this month. Forchion authored the motion, which cites freedoms provided by the First Amendment, attacks U.S. Magistrate Court Judge Arnold Rapoport (he sentenced Forchion and co-defendant Patrick Duffy), and says he should be exempt from drug testing altogether. In short, the charges and probation conditions represent an unconstitutional religious persecution, maintains Forchion. "I'm not creating something," explains Forchion. "I'm using what is already there." For Forchin, this is a massive relief. Though he didn't test positive for marijuana once during his probation, he said there was no way he was going to stop smoking the "sacrament." And because of that, he said he figured he'd ultimately pay for it. The appellate process is an uphill battle as it is, but coordinating it from behind bars would have severely complicated matters. "It moves my case to court," says Forchion. "I don't fight it from a jail cell." The appeals court is likely to rule within two months. Until then, Forchion knows what he'll be doing. "Praying for true Religious freedom RASTA style". A Browns Mills man stood before three appellate judges Wednesday, asking them to overturn his prior indictments on marijuana charges stemming from a 1997 incident. Ed Forchion, a marijuana advocate, claims the courts, prosecutor and public defender's office denied his constitutional rights on numerous fronts, including due process and equal protection and illegal search and seizure. Donning his favorite uniform - a cannabis leaf on the back and the slogan, "I love my country; I fear my government" on the front - Forchion made an impassioned plea. "Just because I advocate legalization doesn't mean I am denied certain rights," the 40-year-old said. Why dredge up the past? Said Forchion: "Addiction may be conquered, but conviction is not. Once convicted of a crime, it's a life sentence." His conviction shows up when he applies for jobs. A truck driver, Forchion lost his truck and his house in the aftermath of the legal proceedings that date from his arrest in Bellmawr in November 1997. A decision could take as long as 90 days. Should the court dismiss the indictments, Forchion faces possible trials and jail time on two other unrelated charges lumped in with the pot bust: A weapons violation for carrying a stolen gun and a theft charge for swiping $500 in chips off a blackjack table in Atlantic City, both from 1996. But Forchion already served 17 months and with probation, would not have to serve more time, his lawyer John Vincent Saykanic said. "I've never seen a case with so many constitutional violations," said Saykanic. Key to Forchion's appeal is a claim that a significant piece of evidence - a cooler containing marijuana - was illegally searched in Arizona without benefit of a warrant first. The package went from Arizona to Philadelphia and finally to Bellmawr, where authorities obtained a warrant and arrested Forchion and his brother, Russell. "The search warrant showed what was in the box, so I knew it was opened," Forchion said. "I believe the DEA seized the package and turned it over to state authorities, violating the Fourth Amendment protection against illegal search and seizure." In his appeal, Forchion claimed it took three years before he found out for certain the package was opened prior to obtaining a warrant. Jack Weinberg, the attorney for Camden County, said local investigators were also unaware that the package had been opened until 2000. "As soon as we found out (about the search), we delivered the report to defense counsel chambers." Forchion also criticized the Camden County public defender's office for its refusal to cooperate in building a defense because he favored legalization of marijuana. "We're arguing the public defender should have pursued this case, and was wrong dismissing it out of hand. If he loses, he loses, but they dismissed it," Saykanic told the appellate panel. Faced with a possible 20-year sentence, Forchion accepted a plea bargain in 2000 and received a 10-year sentence. He entered Riverfront Prison in January 2001. In January, 2003, U.S. District Judge Joseph E. Irenas said the state violated Forchion's First Amendment rights to advocate a change in the marijuana laws. If the appellate court rules against him, Forchion can request a hearing before the New Jersey Supreme Court, and if that fails, move to dismiss in federal court. CAMDEN, N.J. - A self-styled marijuana activist will not be allowed to change his name to NJWeedman com. The name change for Edward Forchion was nixed Friday by Superior Court Judge John A. Fratto. A spokesman for the Camden County Prosecutor's Office said the ruling came after prosecutors argued the name change would "promote an illegal activity." He subsequently was jailed for five months by authorities who said he violated the program by filming public service announcements pressing for changes to New Jersey's laws and advocating legalizing marijuana. When he was released from jail in January 2003, Forchion was returned to the early-release program but barred by a judge from promoting illegal use of marijuana after his release. Forchion, who refers to himself as "NJ Weedman," has said he used marijuana because of his religious beliefs and for medical reasons. He has made three bids for a seat in Congress, losing twice and quitting one race after being indicted on drug charges. A marijuana activist won a round Tuesday in his fight to change his name to NJWeedman com. A three-judge appeals panel overturned a lower-court ruling that barred the switch sought by Edward Forchion Jr., 39, of Browns Mills. Forchion will appear in Superior Court in Camden to argue in person for the name change, which the Camden County Prosecutor's Office opposes. The appeals court said the lower-court decision was flawed because Forchion was required to submit his arguments in writing while an assistant prosecutor appeared in person before Superior Court Judge Allan Vogelson. At the time of the February 2002 hearing, Forchion was serving a term in state prison for possession of marijuana. "The state got to tear apart my brief," said Forchion, who has since been released from prison. "I was denied my right to present my position adequately." Newly off probation, Ed Forchion of Browns Mills announced a bid for the U.S. House, then lit up. Call it a joint announcement. A South Jersey advocate for the liberalization of marijuana laws declared his candidacy for the U.S. House at Independence National Historical Park by - how else? - lighting up a marijuana cigarette. Not that he got a chance to smoke it. After just a few tokes Saturday afternoon, a phalanx of 17 park rangers surrounded Ed Forchion, also known as NJ Weedman. Minutes before, while standing between Independence Hall and the Liberty Bell Pavilion, Forchion said he intended to run as the U.S. Marijuana Party's candidate for the seat held by Republican Jim Saxton in New Jersey's Third Congressional District. The district extends across Burlington and Ocean Counties and includes a few neighborhoods in Camden County. Also cited shortly after 4:20 p.m. was Pat Duff, 27, who said he intended to run as the Marijuana Party's candidate for Philadelphia City Council in 2007. The self-described "renegade car salesman" said he would run on a platform encouraging the opening of cannabis cafes across the city. About 50 supporters, many with video cameras and shivering against the wind, had gathered to watch Forchion and Duff ceremoniously light up. The time and setting had been chosen with Karl Rove-ian precision. "Four-20" is stoner slang for smoking marijuana. The park had the benefit of being federal property, outside the jurisdiction of the Philadelphia Police Department. "We're peaceful, patriotic potheads," the soft-spoken Forchion said. "We had meant to do this on Dec. 6, but it snowed and ruined what we'd thought was going to be a big turnout." On Dec. 3, Forchion completed 20 months of probation in Camden County for pleading guilty to possessing five pounds of marijuana with the intent to distribute. "I'm happy," he said of putting probation behind him, "I can run for office again." Forchion, of Browns Mills, has run for Burlington County freeholder and for the First District seat in the U.S. House on the Legalize Marijuana ticket. A Rastafarian, Forchion has said he smoked marijuana for religious reasons, to relieve back pain, and to help him deal with chronic depression. The former cross-country truck driver has been an advocate of legalizing marijuana since the mid-1990s. His high jinks have been celebrated in what is left of the counterculture. Among his stunts: lighting up in the New Jersey Assembly while wearing a black-and-white-striped prisoner's costume. Saturday's announcement was intended to make a more sober point, he said, adding that he intended to challenge the rangers' citations in court. Mount Holly, NJ - As medical marijuana smokers around the globe celebrate "4/20"-- an internationally recognized date for the celebration of cannabis--Ed Forchion, akaNJWeedman and his lawyer, John Vincent Saykanic, Esq., will be filing a historic legal brief in New Jersey's Burlington County Superior Court, battling for not only Forchion's freedom but for the rights and recognition of marijuana smokers everywhere (Indictment No. 2010-08-066-I). The filing is historic as it challenges New Jersey drug legislation and may change how the state's medical and criminal marijuana laws are enforced. On April 1, 2010, Ed Forchion was arrested in Mount Holly, New Jersey with a pound of cannabis in the trunk of his car. A Burlington County grand jury indicted Forchion in August of last year for violation of the State's drug laws. In October 2010 he pleaded not guilty. He faces more than a decade in prison if convicted. Forchion is a dual citizen of New Jersey and California, and he has been evaluated and approved by a medical doctor in California to use marijuana (and has been given a California Medical Marijuana card, which was valid on the date of his New Jersey arrest). Mr. Forchion also operates a medical marijuana (dispensary) Temple in Hollywood, California called the "Liberty Bell Temple II." In December 2010, Superior Court Judge Charles Delehey permitted Forchion to challenge the constitutionality of the state's marijuana laws, which makes marijuana possession illegal (and a Schedule I drug) because it purportedly has no medicinal value. At the same time, New Jersey is implementing a medical marijuana program for the treatment of needy and ill citizens since New Jersey became the 15th state to legalize the use of medical marijuana on January 18, 2010. The legal brief raises eight grounds explaining why the indictment must be dismissed. These include that Mr. Forchion, as a practicing Rastafarian, should be granted a religious exemption under the First Amendment (and Equal Protection Clause) to possess marijuana since marijuana-known as ganja in the religion-operates as a sacrament and is an integral part of the Rastafarian religious ceremony. Since American Indians are granted an exemption to utilize peyote (a Schedule I drug) in their religious ceremonies, and since the Brazilian church Uniao do Vegetal (in New Mexico) is permitted an exemption to utilize the sacramental tea ayahuasca (also a Schedule I drug), Rastafarians should be afforded the same religious exemption and equal protection. Other issues raised in the brief are: that marijuana should no longer be classified as a Schedule I drug (with the hardest drugs such as heroin, LSD, etc.) since even the State of New Jersey now recognizes its medicinal value; that Forchion should be able to possess the marijuana on the grounds of "medical necessity" since he is a medical marijuana patient (approved in California, one of his two residences); and that the New Jersey marijuana laws do not provide adequate notice that he could not possess his required medicine (and religious sacrament). Saykanic says, "It's not only un-American that Rastafarians are discriminated against for their sacred religious views, but it's outrageous that the alleged 'illegal' drug that is their sacrament has now been acknowledged by the State to have great medicinal value, yet they continue to be persecuted." Saykanic also says, "The war on drugs is a complete failure and the most glaring example is the law illegalizing marijuana. The question to be asked is not whether marijuana should be legal but who is making huge profits (and gaining political capital) by propagating the war on marijuana and other drugs? The failed war is a ridiculous waste of taxpayers' money and a denial of basic American privacy and liberty rights. Ed's case could well be the beginning of the end of drug law tyranny. " "The state of New Jersey has made a mistake in classifying marijuana as just a criminal substance," avows Forchion. Forchion says he uses marijuana for medicinal and religious purposes. Marijuana is frequently used for healing and ritualistic purposes in Rastafarianism, a religion he practices. Forchion will move to represent himself at trial. As detailed in his book release, "Public Enemy # 420," Forchion has a history that spans decades in his quest for his right to smoke marijuana legally. A cult figure in the marijuana legalization community, he achieved media notoriety when he was arrested for smoking marijuana in front of the entire New Jersey State Assembly in 2000, and garnered a national platform when he fired it up at Liberty Bell in Philadelphia, PA during the Republican National Convention. Forchion has since become one of the most vocal and recognized members of the pro-pot movement. He is the founder of the Legalize Marijuana Party of New Jersey and has run previous campaigns for Governor, U.S. Senate, Congress, the State Legislature, and the Burlington County Board of Freeholders.